For my PHP/MySQL assignment the brief was to create a website for the Lido Cinema including a functioning backend CMS for adding movies and session times. I had fun putting together the artwork and designing the layout for this site. 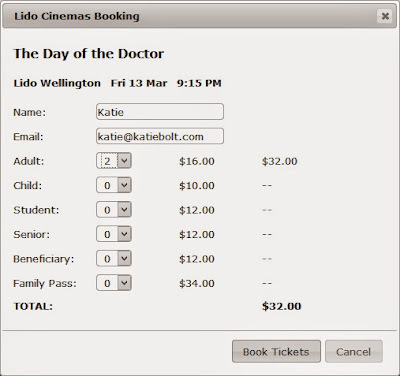 The CMS allows you to add, edit and delete cinemas, movies, session times (for the date and time I used the jQuery timepicker), the pricing structure for tickets, and admin users. Once I'd finished the site my tutor suggested I try adding the functionality to book tickets to a session. This required a slight reworking of my table structure and some more jQuery but was a good challenge.